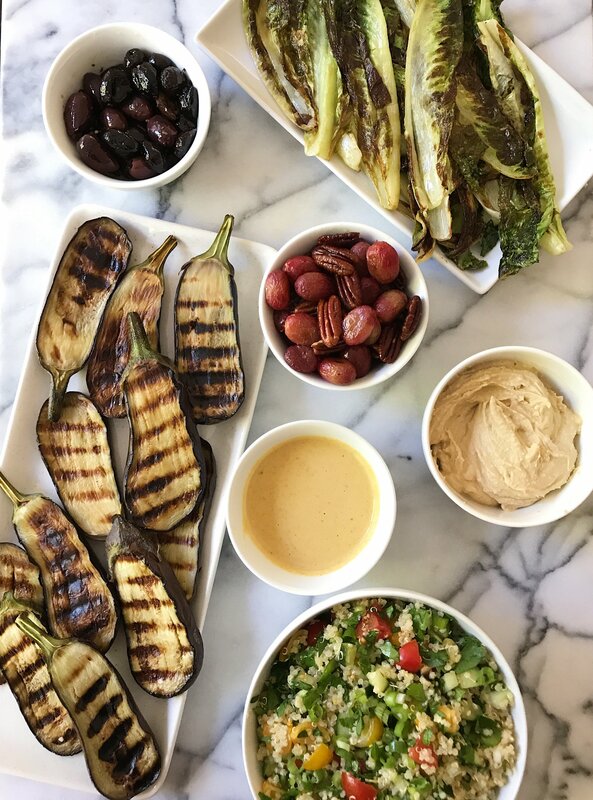 We’re capping off the weekend with a big Mediterranean spread with something for everyone: Quinoa Tabbouleh (I also left some quinoa plain because my son prefers it that way), Easy Homemade Hummus, Grilled Eggplant with Tahini Sauce (sauce from Cooking Light), Grilled Romaine, Roasted Grapes (inspired by and adapted from Gfree Foodie), marinated Olives and some Breaded Chicken. All so good! And best part of making a big Sunday spread is that there are leftovers for the next day or so. A big bowl of Mediterranean inspired goodness- hummus, quinoa tabbouleh, grilled eggplant with lemony tahini sauce, grilled romaine, avocado, marinated olives and roasted grapes.. Tabbouleh recipe adapted from Ina Garten. 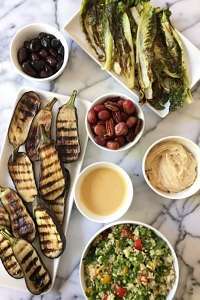 Tahini Sauce from Cooking Light. Roasted Grapes adapted from Gfree Foodie. Lightly brush romaine with olive oil and sprinkle with salt. Heat grill pan over medium hight heat, place romaine in a single layer on pan and grill each side approximately 2 minutes or until romaine wilts. Depending on how much romaine you grill, you may have to grill in stages. Remove from pan, sprinkle with parmesan if using. 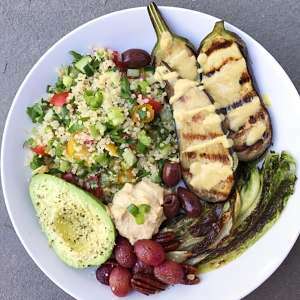 Brush both sides of eggplant with olive oil, sprinkle with a pinch of salt. Over medium high heat, grill on a grill pan or outdoor grill for approximately 15 minutes, flipping once. Whisk all ingredients together in a small bowl. Set aside.